(By Hollie Deese ; Nashville Ledger. Click HERE for Full Article) When it comes to residential real estate around Middle Tennessee, there are plenty of buyers but not nearly enough sellers, says Heather Benjamin with Reliant Realty’s Benjamin McConnell Group. And new construction just can’t keep up with the demand. “We need resale homes,” she says. “Resale homes that are in good condition and priced fairly, even if it’s priced at the top of the fair market value, are sold within 24 to 48 hours in multiple-offer bidding wars.” Benjamin says she currently has several buyers she has been working with who have made multiple offers on properties listed under $300,000 but are losing out to all-cash offers. “One home right in Goodlettsville in Windsor Green off of Conference Drive listed for $199,900, top-of-the-market price, and they had eight or nine offers,” she says. “Two of them were cash. We have sellers that would love to take advantage of the market and either downsize or upsize – the problem is, where are they going to go?” While it is certainly easier to upsize now in terms of inventory, even homes listed at $500,000 and above are finding buyers faster than they had in the past, sitting on the market for 30 to 60 days instead of six months like they were only three years ago. “Two things we’re not making any more of are land and water, but we are certainly bringing in the humans and new construction is dancing as fast as they can,” she adds. Benjamin says she doesn’t sense this will end anytime soon, and she doesn’t anticipate a bubble like the one that was about to burst in 2007. The increase in prices has been slow and steady, and anyone trying to gouge the market is being thwarted in the appraisal process. “Nowadays, getting the loan approved is not the issue, it’s just passing appraisal,” she explains. “So, it is healthy growth that I think better insulates Middle Tennessee should anything else happen. We were one of the first ones to recover, we’ll be one of the last ones to go down.” Smart growth needed Todd Reynolds, director of sales with Gallatin-based Goodall Homes, compares the growth in the counties surrounding Nashville to what his parents experienced when they moved to Charlotte, North Carolina, from Gallatin. He was in college at the time. “I would go and visit, and in the 10 years they lived a little community south of Charlotte, it just exploded all around there,” he says. “Nashville’s just hot as butter. You can’t miss. Everybody’s coming, everybody loves Nashville.” But while Nashville is going through some serious traffic and affordable housing growing pains, Reynolds says the outlying counties can take a cue and concentrate on smart, sustainable growth. “Even though Franklin’s exploded over the years, I always thought they grew smartly,” he adds. “They seem to have a plan and they seem to follow their plan. Nolensville’s another area where we build homes, and they have been very reluctant to grow too fast.” Turns out, the lessons learned in 2007 can still be applied today. “When the market went in the tank, it was amazing how Nashville became the golden child because we didn’t jump off a cliff too fast,” he says. “We were smart. Nashville’s now reaping the rewards of controlled growth. It’s like a stock. You get rich overnight, but it’s going to crash. “Nashville’s more like a mutual fund.” A look at the residential housing market in counties surrounding Davidson and Williamson: Cheatham County The housing market is hit or miss in Cheatham County, depending on where one lives. “If you’re in Kingston Springs, the closer you are to 40, it’s hot,” Benjamin says. “It’s when you get into Pegram and closer out to Ashland City that it slows down. “But there’s still not a whole lot of inventory. Sellers would love to be able to sell, but unless they have the ability to purchase without selling their existing home, they can’t compete in the bidding wars.” Benjamin says fear of selling without something new lined up is preventing people from even listing in the first place. And some people are still upside down from the bubble years. One of the more recent developments in Cheatham’s multi-family housing is the 135-unit Braxton Condominiums at Harpeth Shoals Marina which reached full occupancy last year, but the mixed-use Villages in Pleasant View, still has retail and condo space available. Perhaps most interesting is the sustainable community, Ellersly, in Kingston Springs. Based on sustainable building practices, homeowners will have a five-minute walk to the city park and be close to the Harpeth River. The sidewalk homes will be oriented for passive solar gains, and there are plans for a community garden. The craftsman-style, energy-fit homes range in size from 1,400 square-feet, will have low-maintenance small yards and first-floor master suites for aging-in-place and are priced between $190,000 and $260,000. The development has homes and ready-to-build lots for sale. Dickson County Charles Woodard of Charles Woodard and Associates in Dickson would love to see a gated community come to the area, but he says in the forty-plus years he has been handling real estate in the county there has yet to be a big development announced with plans to build hundreds of homes. “We always had steady growth, and they get close,” Woodard says. “We had a builder that built some cluster-type homes behind the Kroger Shopping Center, and they sold out as fast as they built them. They’re all sold out now.” New developments in Dickson County currently under construction include Sunset Point off Taylor Town Road and White Bluff Hills in White Bluff. They were built after officials lifted the town’s self-imposed moratorium on new development because of overflow problems with the town’s wastewater system. That development moratorium was set after the flood in 2010 and required state officials to counsel the town about any proposed developments to deem them acceptable or not. After the lift in 2014, the five-lot Hallmark subdivision development off Church Street was also able to progress. Woodard says there is a shortage of homes in the county for buyers to choose from, and what does become available goes quickly – especially those priced at $300,000 or below and in good condition. “Anything smaller than that is usually an older house, and the things that are the least desirable are something that needs work on it,” he points out. “Some are buying things like that for rental property.” Benjamin has certainly felt that herself. She says it took her four months to win a home for one of her clients looking to purchase a home in the $150,000 range. “In all of Dickson County, for under $150,000, I was lucky if at any given time there were seven or eight homes on the market,” Benjamin adds. “If they were still on the market after 48 hours, it’s because they needed either a lot of major repairs or they were grossly overpriced.” Woodard says the average sales price over the last six months was $161,576, and the median price was $144,000. That includes 313 properties sold in that time frame that brought 96.5 percent of the listed price. Woodard says those numbers don’t take into consideration new build sales or private sales, and that the larger homes in the area are usually custom built, so something priced at $500,000-$600,000 is most likely a home that was contracted by a buyer to build. Reynolds says they have not looked to build in Cheatham County or Dickson County in the past, but while Cheatham is not a market they are looking to add soon, Dickson could be. “Dickson County might be one that would make sense at some point,” he says. Maury County Maury County has almost 20,000 residents, but there are more coming as many people find themselves priced out of nearby Williamson County but still crave a place south of Nashville. In fact, it is the fourth-fastest-growing county in the state, according to the Maury County Chamber of Economic Alliance. And there are many projects underway to house them all, from apartment rentals to expansive homes. One of those developments, Fox Ridge homes at Grove Park in Columbia, is less than two miles from Saturn Parkway and offers five Craftsman-style home types ranging from $190,000 to $220,000. Nearby, Regent Homes’ Arden Village began developing another 60 lots last year in addition to the ones they had already built since 2008. Those prices start at $190,000 and go to $240,000. Ground will also soon be broken on nearly 185 homes in the gated Eagle Ridge community, and the Oxford Village subdivision offers homes from builder D.R. Horton starting at $170,000. That same builder has homes on the Maury side of Spring Hill, Williams Park, with prices starting around $240,000. Also in Spring Hill, the Worthington Glen apartment complex recently opened with 300 apartments. Bob Parks Realty has projects in Spring Hill, with multiple homes ready to be built along Lori Anne Drive for just under $300,000 There is a 600-home Del Webb community for people age 55-plus under development on the Maury side of Spring Hill. Southern Springs is scheduled to open in 2017. Montgomery County When Google announced it was bringing a $600 million data center and 70 fulltime jobs to the old Hemlock Semiconductor plant, it was a bright moment in potential residential growth for the county that was already humming with activity. Last year, Akebono Brake Corporation officials announced a $48.4 million expansion and 65 more jobs, with Esquire Wire adding 60 jobs through a $1.8 million expansion. And unlike other counties struggling with infrastructure, Clarksville has no shortage of subdivisions, homes and apartments in development. Currently under construction is the Addison at Rossview Phase II, a 136-unit multifamily apartment development, and the Autumnwood Farms subdivision has existing homes and lots for new builds with pricing that ranges from $180,000 to $230,000. Convenient to Fort Campbell and the new Google facility is the Crosswinds subdivision, also with existing homes and lots to build. Ultimately, the development will connect to the Tylertown subdivision and Oakland Hills subdivision. The first section has 175 lots with homes that range from $160,000 to $230,000. And once its own community, a small railroad town that was annexed into Clarksville in the 1960s, New Providence’s real estate includes everything from apartments and studios to single-family homes and mobile homes, with renters making up much of the area. For a long time there was not a lot of construction going on, but now new homes are being built along Sunset Meadows for $200,000 plus. Reynolds sees the potential and is pushing for Goodall Homes to get into Clarksville and Montgomery County. “There’s a lot of opportunity up there,” he says. “It’s just a matter of finding the right thing, really.” Robertson County Ed Cope, president of the Robertson County Association of Realtors, says there are a few developments in the works, but not nearly as much as demand. “The Robertson County area has not laid out the infrastructure like we need to embrace the growth that we’ve got coming,” Cope says. “We have a lot of people, and we are quickly becoming the bedroom community for Davidson County and Clarksville and Bowling Green ­– all three are on fire with their growth, and we’re one of the few undeveloped areas in between those three.” As Robertson County transitions from an agricultural community to a bedroom community, Cope says in order to meet the demand the area needs to address its water and sewer infrastructure. And making 431 a four-lane highway from Joelton into Springfield would also help. “The problem with that is from the I-24 exchange up there to halfway to Springfield is Davidson County, and I can’t really see them wanting to encourage the state to push to spend money for an artery that leaves their county,” Cope says. Springfield is reworking some of their sewage infrastructure now, but Copes says it can still be difficult to get a public water tap on the west side of the city. “With those two obstacles to overcome there’s not been a lot of development as far as subdivisions,” he explains, citing the residential development filled with community amenities around the Long Hollow Pike area in Sumner County as something he would like to see in Robertson. “We don’t have as much as what we need,” he says. “We’re sitting in a perfect place between I-24 and I-65. Everything about our area is fantastic except we need a little bit better access. We need some public sewers. It all goes back to infrastructure. “We’ve been an agricultural community for so long, then suddenly we woke up and the growth is knocking on the front door. We’re rubbing the sleep out of our eyes trying to figure out what to do and where to go.” The city of White House straddles the line of Robertson and Sumner, and Reynolds says Goodall Homes is about to be building homes there for the first time in years, in two different neighborhoods. “We are extremely excited about getting back to White House because we see a huge demand,” Reynolds says. “I was talking to the mayor of White House last night, and he said people in White House don’t want to leave White House once they’re there. They really like it. But when they want to move, there’s nowhere for them to move to. There’s nothing really new.” Area officials approved a site plan for a 950-unit mixed-use development earlier this year to be constructed in about eight phases near Exit 108 on what was once the Bear Creek at Burrus Ridge property. Included in the all-residential community will be 180 townhomes, and nearby, The Standard at White House, will have 240 units of market-rate residential housing and apartment options. “The market is great and our inventory is extremely low,” Cope says. “When something comes on the market anywhere near where it ought to be priced, it’s going to get multiple offers and sell right away.” Reynolds says the focus of Goodall’s development will be on an affordable product because even in the height of the bad market there were still people wanting to buy homes in their budget. “We did great up there the first time,” Reynolds says. “One of the neighborhoods we’re developing, we’ll probably start selling later in the summer, we have a ‘Coming Soon’ sign up, and we have sixty-four people on our waiting list already.” As part of Leadership Middle Tennessee last year, a regional program founded to engage community and business leaders in Middle Tennessee and offer a greater understanding of the critical issues in the region, Cope says people who toured the county fell in love with the quality of life – and the fact you can be in Nashville or Clarksville in just 30 minutes. “We have so much to offer,” he says. “We just need a little more planning and growth. But that’s the beauty of where we’re at. We’re located well and we’ve got a great quality of life. Rutherford County It seems every week a new company is announcing an expansion in Rutherford County, putting more money into the community while creating new jobs to boot. The latest announcement is that Steel Technologies will build an 83,000-square-foot facility in Smyrna, spending $18 million on the company’s second location while creating 50 new jobs. The existing Murfreesboro facility employs 87 people. Construction will begin mid-summer and is expected to be complete by the end of the first quarter of next year. And it’s boons like this that has encouraged Goodall Homes to move into Rutherford County, an area that has always interested the company. “It’s just a matter of finding the right thing at the right time,” Reynolds says. For Goodall, it will be a one-level condo development off Compton Road, close to Siegel High School and the Veterans Administration hospital in Murfreesboro. Ground has not yet been broken, but it should happen shortly. Valleybrook, a Murfreesboro subdivision, has about 180 units planned, 64 of them are condos and the rest will be single-family homes on lots ranging from 6,000 to 12,000 square feet. That development was met with some citizen opposition from homeowners of the nearby subdivision The Reserve, which has homes that range in size from 2,400-square-feet to 4,000-square-feet or more. Concerns involve increased density and water runoff and a desire for all Valleybrook lots to be 12,000-square-feet, similar to The Reserve. Developer Dewey Estes Engineering is currently building luxury apartments on a 17-acre parcel between Manson Lane and I-24 in the Gateway District. And Texas-based homebuilder LGI Homes will begin construction on 250-single-family homes in a new Murfreesboro subdivision, Westwind. According to Realtor.com, there are 209 homes currently for sale in Smyrna with a median list price of $224,000. In Murfreesboro, there are 989 homes on the market with a median list price of $255,000. In Eagleville, 20 homes have a median list price of $237,000. And in La Vergne, the 113 homes listed have a median price of $175,000. Sumner County When it comes to Sumner County and finding homes for its 172,000 residents, it doesn’t get hotter than Hendersonville, says Benjamin, unless it’s the Sumner side of Goodlettsville. 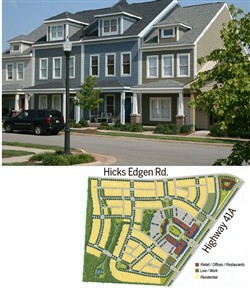 One of the most recent – and most extensive – developments in the county is the mixed-use Durham Farms in Hendersonville, which features seven types of homes, more than 1,000 in all, ranging in size and scope around the planned town center. Townhomes start around $175,000, with single-family homes starting in the high $200,000s to nearly $700,000. When completed, Durham Farms will have green park space, walking trails, fitness club, playground and an amenity center. Also in Hendersonville is Goodall Homes’ Millstone development on Saundersville Road, with more than 600 homes, including 420 single-family homes and nearly 200 more cottages and townhomes. Reynolds grew up in Sumner County and has been doing new homes sales since 1993, and has been with Goodall since 2007 – right when the bubble burst. He says in 2010 they sold 101 houses the entire year. In the first quarter of this year, they have already sold 127. “It is a whole different world, especially in Sumner County,” he says. And while Millstone is their biggest development currently under construction in the area, they are also developing in Carellton off of Long Hollow Pike along with a few other builders. Carellton is zoned for Station Camp schools and will include a pool, cabana and walking trails. Pricing ranges are from $301,990 - $328,990 “We’ve got several years’ worth of lots in there,” Reynolds says. “It’s a master plan community that is going to have a club house and swimming pool. We just buy lots from them every quarter as we go.” Benjamin says Gallatin’s growth is exploding too, thanks to Hendersonville being so full, strong employment growth with moves like the relocation of Beretta USA to Gallatin, improving schools, the blossoming square, access to Old Hickory Lake and recent eligibility for USDA financing. And higher-end developments like Fairvue are selling faster than ever. “On the lower end, if you’re under $500,000 in there, you’re gone,” she says. Reynolds agrees, and says the Foxland Harbor and Fairvue developments are both doing so well they have even run out of lots in Fairvue and are waiting for their next set. “Foxland in particular … three years ago there was nothing really selling,” Reynolds says. “A few custom homes were being built, but we came in, and it really took us a little while to figure out the market and where we needed to be with the price and features.” Once they figured that out, sales took off. “I don’t play golf very often out there, but when I do, I’m amazed,” he says. “Three years ago there were some houses, but when you go out there today, it’s incredible. It’s just transformed in the last two years. There’s a lot more houses to hit from the golf course then there used to be.” Another of Goodall’s Gallatin developments, Elk Acres, had sold out of developed lots, and for the past year, they have focused on other properties. Goodall officials recently opened back up sales in Elk Acres, starting in the $180,000 range, and in less than a week had four appointments to sell homes. And he attributes the popularity to the price. “A couple years ago the sweet spot everybody wanted to be under was $250, 000,” Reynolds explains. “Then it switched, and now it’s more like if you can be under $325,000. But where there’s just not a lot is the $175,000-$250,000 range. You just don’t find it right now. It’s really hard in the Hendersonville area to find it.” Reynolds says he recently looked at a parcel of land behind the Verizon Wireless dealer on Nashville Pike in Gallatin to see if it would be a place where they might build town homes. “The funny thing is five years ago, I would’ve said ‘Townhomes won’t work here in Gallatin. There’s not enough demand, not enough draw,’” Reynolds adds. “But today, they’ll work. There’s demographic for those townhomes now. Five years ago, it wouldn’t have been cool for that demographic to really look at Gallatin. It’s changed, and affordability is a big part of that.” He attributes the new energy surrounding the square and newfound commercial growth for the boost in buyers from outside the area. “That’s the one thing Williamson County has always had, they had the commercial growth first and the residential growth follows that,” Reynolds says. “I’m not sure Gallatin ever had that kind of growth. Now, that’s what drives demand in a market. Hendersonville’s growing faster, but I think Gallatin has waited, has been patient and has been smart.” Wilson County Another county benefitting from a boost in commercial growth, Reynolds says the two neighborhoods Goodall has in Wilson County have done very well and very consistently for the past few years, but Benjamin says you can’t get anything under $200,000 in Mt. Juliet right now. That is all thanks, in part, to businesses like Under Armour and Amazon setting up large distribution facilities in the county, along with mixed-use projects like Mt. Juliet’s Providence MarketPlace and the latest $10-million project announced from Commercial Realty Services that will include retail and office space. And just like Gallatin’s bustling square is driving new energy to the area, so is Lebanon’s. A 400-unit apartment complex, Hartmann Plantation, is being built off the Hartmann Drive exit and has one-, two-, three- and four-bedroom townhouse units. Some residents are already living there. Along the 109 connector from Lebanon to Gallatin the green light has been given for a 700-unit apartment complex, and commuters have also been filling up the commuter community Hamilton Springs in Lebanon. And nearby the Hamilton Station apartments on Highway 70 finished their latest addition.